The Power Furnace is our first Best InGame Practice here at BetterInGame. The purpose of this build is to optimize the furnace, and we will use two of them in this build. A furnace has two inputs and one output. By using hoppers, the system ensures both input slots are continually full and that the output slot is empty. For fuel, we will use a sustainable resource, but it will require a large amount of iron to fully stock. 1. Clear out an area five high (four is also ok) and four wide where you want to build this unit. You also want to consider making room for several of these side by side to make a really fast group of furnaces. 2. Place both furnaces side-by-side two blocks (one if only four high) above the ground. 3. Place two chests side-by-side two blocks above the furnaces and two blocks below the furnaces. These chests should line up vertically with the furnaces. 4. Add two hoppers going from the highest double chest into the top of the furnaces. 5. Add two hoppers going from the bottom of the furnaces into the top of the lowest double chest. 6. Place a single chest one block to the left and one block to the right of the hoppers going into the top of the furnaces. 7. 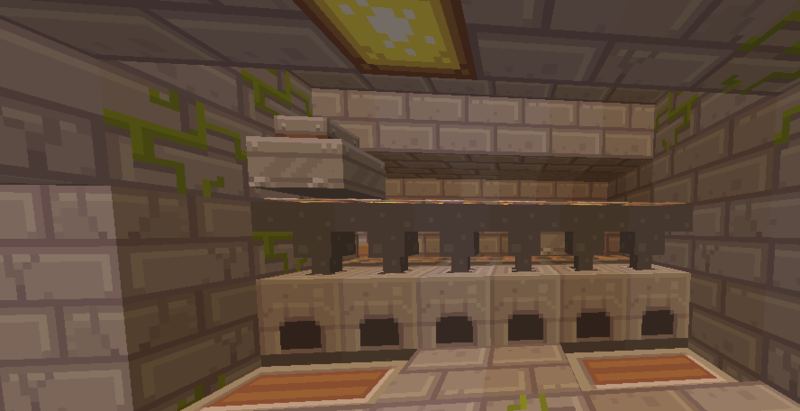 Place hoppers under each single chest directed into the furnace. To use the Power Furnace, you will need two things. 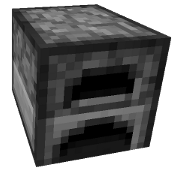 First, something to cook such as cobblestone, sand, or some form of ore. Second, is a fuel source, preferably lava buckets (see below). Fill the highest double chest with the material you want to cook. Then, fill the side single chests with lava buckets. Last, you wait. The system will keep both furnaces full of source blocks and lava buckets, while all of the completed material will flow down into the bottom double chest. You can quickly cook a double chest of sand into a double chest of glass without doing anything once the system is setup besides waiting. Hoppers - You control the direction that the hopper feeds by pointing in the direction you want it to point when placing it. E.g. pointing to the right of the block you want to place the hopper will point the bottom toward the right. Lava Buckets – Lava buckets are a great resource for fuel because if you have access to the Nether, you have access to unlimited lava. If you are using some form of “home” system such as Essentials, Residence, etc., you can use this to your advantage. Travel into the Nether and walk until you encounter lava that you can touch (preferably a large pool). Once you have the edge of a lava pool, set a home at this location. Whenever you need more lava, teleport there and full up all your buckets. Free fuel! This is a great way to process raw materials quickly and efficiently; just remember that you're not getting any experience with this approach. So if you're one of those people that don't want to miss out on any opportunities for experience, you might want to be wary of this technique. Does this work with smelting ores and the MCMMO smelting skill?? i wouldn't think it would.. I like that marg! are there hoppers underneath? Sounds like Marg will be publishing a new article shortly! If it isn't clear, I would love if people document their cool builds on the website. Yes, there are hoppers underneath that run to those chests that are sunken into the floor. I think maybe the mcmmo smelting bonuses, but not the xp bonuses, will work, but only if you place the items into furnaces yourself. I'm going to mess around with it and test it out. I can write up a little article about construction and my experiences with it in the next couple of days. I smelted several stacks of iron ore this morning: one in a traditional furnace, one in a power furnace with automated fuel and collection (but manually filling the furnaces with ore), and one in a traditional power furnace with auto everything. I'm happy to report that the output was the same for each method, give or take a single ingot, so the mcmmo bonuses do seem to work with the power furnaces. I didn't watch my xp though, so I can't say about that. I never knew what this was! Nub here. I'm used to everything before emerald came out. I will definitely have to try this on Pure. I smelt a ton of sand. Desert right next to me. I see people with tracks by there builds. 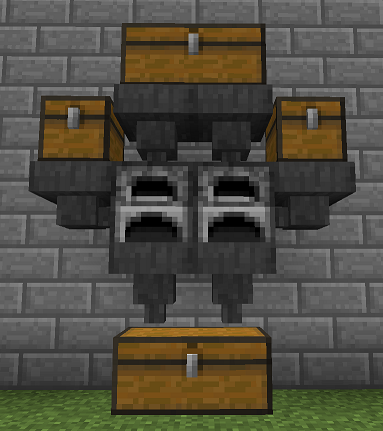 And with chest carts. What is with that?